Micro Machines is Back and It’s Better Than Ever! 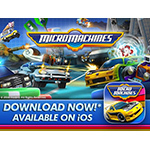 REDWOOD CITY, Calif.--(BUSINESS WIRE)--Leading independent mobile games publisher Chillingo, a division of Electronic Arts Inc. (NASDAQ:EA) today announced the worldwide launch of Micro Machines . Codemasters’ legendary small-scale multiplayer game makes its debut on the App Store with the same classic thrills and laughs of the original toy-based series, in this exciting all-new combat racer. Micro Machines allows up to four players to play in miniaturized, combative racing fun across 10 tracks of tabletops, desks, pool tables and kitchen sinks. There are three race modes including a brand new, fan favorite, ‘Battle Mode,’ which makes the game accessible and fun for everyone! Players can collect and race with over 60 unique vehicles and 60 types of weapon modifications at launch ranging from flame throwers and shrink rays to Nerf blasters in battle arenas. The nostalgia of the original 90s classic is also rendered for today’s mobile devices at 60 frames per second! 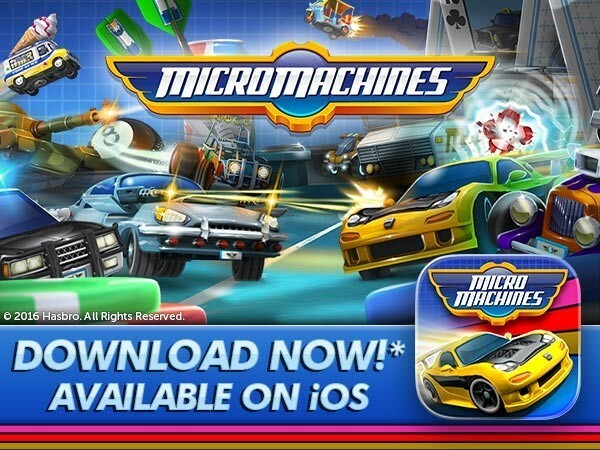 Micro Machines is free-to-download* and delivers a truly social experience at its core with PvP gameplay so there are constant thrills and actions. Plus more exciting content will be coming soon featuring popular Hasbro brands! For more information about Micro Machines, please visit Facebook to learn more. Chillingo, a subsidiary of Electronic Arts, is a leading mobile games publisher with numerous award-winning hits around the world including Angry Birds, Cut the Rope, Iron Force, Perfect Kick, Catapult King, Pixel People; and countless others. The company publishes games for iOS and Android platforms. For more information about the company and its games, please visit www.chillingo.com. Codemasters, the award winning video game developer and publisher, has a 30-year heritage. With titles distributed globally, Codemasters is a leading developer and publisher of driving and racing entertainment games including DiRT, GRID and the official BAFTA award-winning FORMULA 1 series of videogames. Since March 2010, Reliance Big Entertainment Ltd. (RBEL), a part of India’s Reliance ADA group, has been the principal shareholder (60%), alongside existing investor, Balderton Capital, the leading European venture capital firm. For more information on Codemasters’ product portfolio, please visit www.codemasters.com. Join in the conversation with @Codemasters on Twitter or Like us on Facebook at www.facebook.com/codemasters. Hasbro (NASDAQ: HAS) is a global company committed to Creating the World’s Best Play Experiences, by leveraging its beloved brands, including LITTLEST PET SHOP, MAGIC: THE GATHERING, MONOPOLY, MY LITTLE PONY, NERF and TRANSFORMERS, and premier partner brands. From toys and games, television programming, motion pictures, digital gaming and a comprehensive lifestyle licensing program, Hasbro fulfills the fundamental need for play and connection for children and families around the world. The Company’s Hasbro Studios creates entertainment brand-driven storytelling across mediums, including television, film and more. Through the company's commitment to corporate social responsibility, including philanthropy, Hasbro is helping to build a safe and sustainable world and to positively impact the lives of millions of children and families every year. Learn more at www.hasbro.com and follow us on Twitter (@Hasbro & @HasbroNews). MICRO MACHINES and all related characters are trademarks of Hasbro and are used with permission. ©2015 Hasbro. All Rights Reserved. © 2015 The Codemasters Software Company Limited (“Codemasters”). All rights reserved.